We’ll assist you in checking in to the hotel and our guide will help you with your luggage. You can enjoy the rest of the day whatever you fancy. Optional activities in Nairobi can be done at extra cost. A visit to the David Sheldrick elephant orphanage at the Nairobi Game Park headquarters. The elephants are fed from 11 am to noon. Visit these and other endangered animals like the black rhino. Enjoy a visit to the Giraffe Center where you can hand-feed the giraffes then stop at the Karen Blixen house, once lived in by Karen, it became famous as the movie set of “Out of Africa” with Meryl Streep and Robert Redford. (Try to see the movie again!) Ms. Blixen’s good works, among and for the local people, have made her into a legend. If you are interested in the local jewelry, you can visit the Kazuri Bead Factory. It’s an all-woman craft workshop that is renowned for making fabulous clay beads and jewelry. The Factory is a co-operative enterprise founded several decades ago by an English woman who wanted to help single mothers become self-supporting. The clay beads are as amazing as the story of the Factory’s evolution. Today, wake up at your hotel and then meet your driver guide who will drive you to the Amboseli National Park. The park is well-known for the abundance of Elephant herds and this is also the best point for viewing the majestic Kilimanjaro mountain range which is the top peak in Africa. Visibility depends on the clarity at the time of visit. Upon arrival to our destination, we’ll help in checking in before you are served with hot lunch at Kibo Safari Camp located against the magnificent backdrop of Africa’s highest mountain, the glittering Mount Kilimanjaro. The camp enjoys a uniquely privileged position even though it is situated outside this world-famous national park. In the afternoon, we’ll depart for a game drive in the park and to search some of the resident species as well as to spot some of the big 5 game. We’ll be back to the lodge for dinner and overnight stay. Have another full day in Amboseli to enjoy the majestic views of the National park and it is also called as “The Kilimanjaro Royal Court”. Crowned by Mount Kilimanjaro, Africa’s highest peak, the Amboseli National Parks is one of Kenya’s most popular parks. 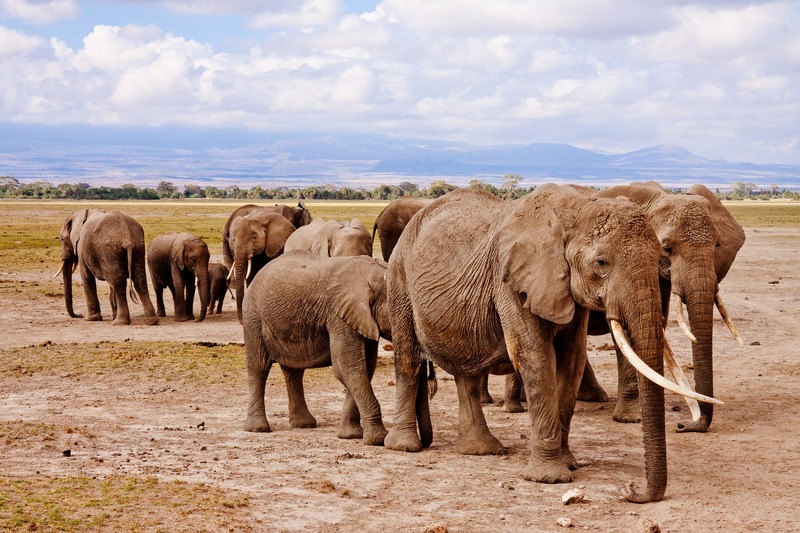 The name “Amboseli” comes from a Maasai word meaning “salty dust”, and it is one of the best places in Africa to view large herds of elephants up close. Nature lovers can explore five different habitats here ranging from the dried-up bed of Lake Amboseli, wetlands with Sulphur springs, the savannah and woodlands. Enjoy your morning and afternoon game drive. After breakfast, you will meet up with your guide and head off to Naivasha. You’ll have a stop at the Great Rift Valley to admire the scenery as you make your way through rural Kenya onto the Rift Valley, an area boasting quaint little villages which dot the traditional African landscape. Prepare yourself for your first glimpse of Mount Longonot. Upon Arrival, experience a warm welcome with a free welcome drink as you check in, then assisted to your respective room. Head to the restaurant for hot lunch later. You can choose optional activities at extra cost. You can go for excitingly unique boat ride excursion to the Crescent Island Wildlife Sanctuary whilst in the Lake Naivasha area today. Admire the scenery as you take a short boat trip from the mainland to this dynamic location where you’ll have the opportunity to get in some wildlife viewing at a very relaxed pace. As there is little to no threat from some of the “Big 5” predators, the various species of wildlife, birdlife and flora live quite freely here, providing visitors with some great photo opportunities. Some of the many mammals that can be seen here include zebras, impalas, buffaloes, giraffes, and hippos. Resident bird species include herons, black cranes, lily-trotters, ospreys and fish eagles. This add-on will cost you USD 65. After breakfast, your guide will drive you from Lake Naivasha to Masai Mara. En route, you will have two stops to stretch yourself and enjoy the wonderful rural scenery. After enjoying your afternoon Kenyan tea and coffee, head out this afternoon for an exciting game viewing adventure. Search some of the area’s wildlife hot-spots determined by your driver guide, as they’ve learned and now understand the games daily routines through tracking. Some wildlife is more difficult than others to spot, for instance, the Leopard. These spotted cats blend almost seamlessly into the tall grass and shrubbery, and are even more challenging to spot up in their favorite hangout, the trees. Your guide will take you to nearby watering holes, where on a hot day, you might spot many bird and wildlife species, including the elusive cats. After game drive, head back to your lodge. Wake up this morning to a lovely African sunrise and at the lobby coffee, tea and cookies will be ready for you. Drive off to another adventurous safari drive in search of wild animals. The early mornings and evenings are the best times to watch the big cats hunt – the lion, cheetah and leopard. At these times the most glorious sunrise can be observed. Afterwards, return to the camp for a full buffet breakfast. Lunch will be served in the restaurant, after which, you will have time to rest before the evening safari. We will take you for another exciting evening safari in search of the “big five” the lion, leopard, rhino, elephant and the buffalo. After the game drive, you will be driven back to the camp. Dinner and overnight at the lodge. Enjoy your buffet breakfast at the lodge. Check out and your driver guide will drive you from Masai Mara to Nairobi, with short stop-over’s for optional refreshments and shopping for souvenirs. Arrival into Nairobi will be in the afternoon. Lunch on your own account. After lunch, you will have some time for a leisure. You can use this opportunity to explore the local markets and shops presents itself today as so you can interact with the local vendors in search for the perfect handicraft or souvenir for yourself or your loved ones before being transferred to Jomo Kenyatta International Airport for your departure flight.